What Day Of The Week Was March 30? 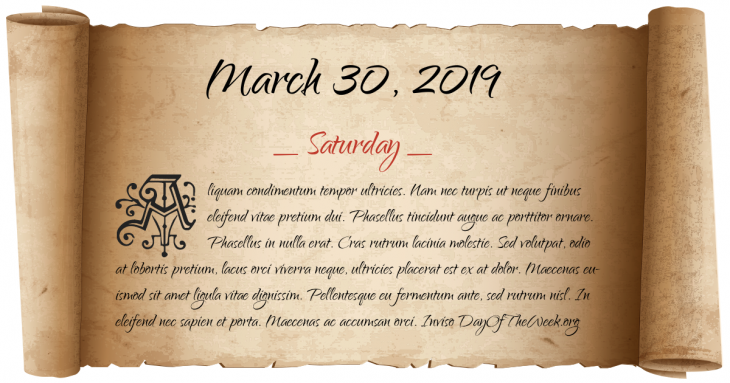 March 30, 2019 was the 89th day of the year 2019 in the Gregorian calendar. There were 276 days remaining until the end of the year. The day of the week was Saturday. The people of Sicily rebel against the Angevin king Charles I, in what becomes known as the Sicilian Vespers. Edward I sacks Berwick-upon-Tweed, during armed conflict between Scotland and England. Joachim Murat issues the Rimini Declaration which would later inspire Italian Unification. The Treaty of Paris is signed, ending the Crimean War. The Battle for Kushka triggers the Panjdeh Incident which nearly gives rise to war between the British Empire and Russian Empire. The Heinkel He 100 fighter sets a world airspeed record of 463 mph. World War II: Allied bombers conduct their most severe bombing run on Sofia, Bulgaria. President Ronald Reagan is shot in the chest outside a Washington, D.C., hotel by John Hinckley, Jr.
Space Shuttle program: STS-3 Mission is completed with the landing of Columbia at White Sands Missile Range, New Mexico. Twelve gunmen attack the Manawan Police Academy in Lahore, Pakistan. Who were born on March 30?